Everyone needs to get outside! Extending your living space to a covered porch, lets you enjoy the weather even on rainy days! Some of us want to be outside, and need a respite from the suns rays. 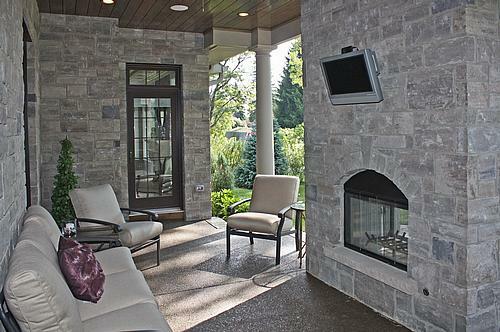 This out door patio design is functional for more than one season. With wood burning fire place, covered porch and comfy furniture. This outside family room has a TV over the fireplace, to enjoy a movie or have coffee while the morning news is on. Entry onto this great outdoor space is from the Master Suite, the Great Room and the Kitchen. Open the doors to any of these rooms and bring the outside in. Fans circulate the air and create a breeze, the stone fireplace makes it cozy and extends the outdoor season, and creates a sense of intimacy and privacy. Bathrooms have been evolving. They are not just a rooms to get ready for the day. They are spaces that have become a favorite place to relax in your homes and apartments. This bath was created with tranquility in mind. A place to come home and unwind in. Simple lines and and whimsically adorned, this retreat welcomes you, while the drawn bath, relaxes the body and the mind. Creating this space consists of a neutral pallet, rustic decor mixed with mixed metals. Larger scaled tile in a brick pattern, lightly striated with texture mimicking grass shoots. 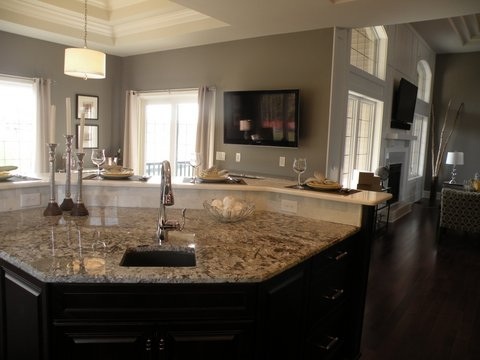 Granite counters in subtle tones and stone and glass accent back splash, the color of beach glass. 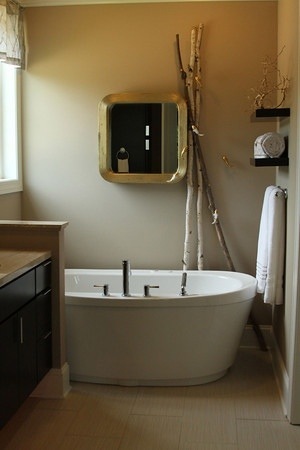 Mixed metals working together as the accents, show the harmony that silver and gold can have together in in this understated bath. Taking traditional living spaces and transforming them for new uses gives an update to the home you have lived in for years. And in the case of new build designs, looking at an existing plan, and using spaces for your families life styles instead, can produce multi-functioning options for the same space. In this kitchen, I transformed the traditional eating area into a mini gathering room. A desk and comfortable chairs, allows for organization and relaxation, in the hub of the house, the kitchen. Also shown in these photos is a 42″ plasma TV situated above cabinets that house audio components and other not so used kitchen items. The furniture is positioned to view the TV and other living spaces , and take in the view to the back yard and adjoining covered patio. Talk about seamlessly extending living spaces from inside to outside, the transition and entertainment is easy with large slider to allow flow to both rooms.